Greenville Implant Restoration - Dr. William W. Brown, Jr.
Do you have missing teeth but don’t want to wear dentures or bridges? Do you want to eat your favorite foods again and not worry about unstable, false teeth? 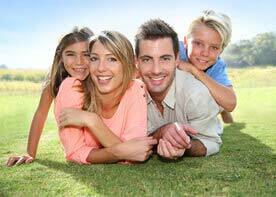 Now you can “grow” new teeth with dental implant restorations from Greenville, SC dentist Dr. Brown. Dr. Brown restores dental implants with individual crowns, bridgework or overdentures. Implants allow you to eat whatever you want. They restore almost 100% of your chewing ability. They will never come off or fall out of your mouth. 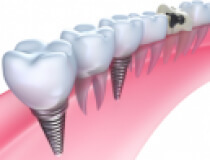 Dental implants prevent bone deterioration. Full-sized dental implant placement usually requires several months to complete. First, the oral surgeon makes a hole in the gums to embed the implant screw. After the site has healed completely, the surgeon uncovers the implant and attaches a small metal bar to the top of the implant. Next, Dr. Brown will take impressions of the tooth and create the restoration. It can be an individual crown, a fixed bridge or an overdenture (dentures attached to a series of dental implants). Finally, the restoration is attached to the implant. Most people who can undergo tooth extraction can also undergo implant placement. The bone at the implant site must be tall and thick enough (if using conventional implants), and the patient must be in good overall health. The best way to find out if you are good candidate for dental implant restorations is click here to reqeust an appointment with your dentist in Greenville, SC. Call now!